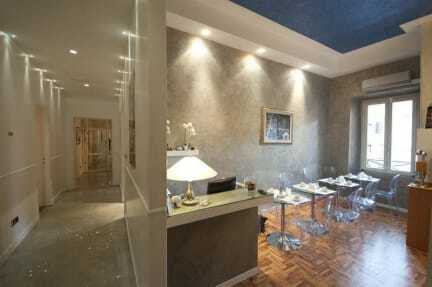 Relais Conte di Cavour de Luxe i Roma, Italia: Bestill nå! you can take the room immediately if it has been let free and prepared for you. for the staff who will attend you. Sorry, we don't have night-porter service. We don't accept check-in after 8pm for 1 night stay only. For the most sophisticated business and leisure travelers, Relais Conte di Cavour has been created from an ideal of home away from home, where the concept of the traditional hotel is lost. We work as a low cost airline... less costs, better rates... offering a limited range of services (reduced reception hours, additional services on request and payment, ...), however, all the essential and necessary ones are guaranteed enjoying optimal quality-price ratio. 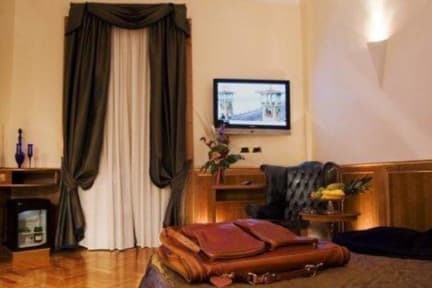 It is located in the heart of the city of Rome, a unique and prestigious property, intimate and exclusive, assuring the highest level of service, as each room is catered to by a professional butler. The architectural features of this historical land mark, like the hand painted vaulted ceilings and large shuttered windows, have been preserved to provide guests with a unique environment. Check in from 12:00 to 20:00. Check-in after 20:00 there is EUR 20,00 fee for extra service of late reception paid in cash on your arrival for the staff who will attend you. Sorry, we don't have night-porter service.